We will be happy to discuss our high quality personal service and your individual requirements at the following events - see you there! Come and see us at the National Dental Technicians Conference at Loughborough University where Edward Attenborough will be giving the keynote speech on the business of dental technology in todays market, and how to maximise your profit using digital technology. Come and see us in Hall 10.2, Aisle V, Stand 011 at the Worlds biggest dental show. We will be looking for international dealers for our rotary polishing brushes and launching our new international CAD-CAM venture. For more information visit IDS 2013. Just about anyone who is anyone in the dentistry business gathered at the NEC Birmingham for The Dentistry Show on Friday 1st and Saturday 2nd March. Edward Attenborough gave the kynote speech on CAD-CAM at the Aesthetic Technicians conference. Over 5,000 dental professionals enjoyed meeting with more than 300 leading suppliers (the most ever), listening to over 50 world-class accredited conference sessions, accessing over 55 hours of FREE verifiable CPD, networking with senior executives, major associations and industry media over two action-packed days, and the atmosphere was buzzing! We present the new version of the Dental Wings Operating System, the Roland DWX-50 milling machine and the Datron D5 milling machine. Cavenish Imaging are holding 2 open days for referring clinicians to visit their new state of the art CBCT patient scanning facilities at DenCity. Viewing by appointment - please contact Cavendish Imaging for more information. We present the new version of the Dental Wings Operating System and the Roland DWX-50 milling machine. Come and see us at the UK's premier dental exhibition, Dental Showcase, which will take place at ExCeL, London Docklands on October 4 - 6, 2012. Over 12,000 members of the dental team are expected to attend the three-day event. More than 370 companies from the UK and abroad are likely to exhibit and the exhibition will cover a massive 17,000 sqm. For more information visit Dental Showcase 2012. We exhibit for the first time at the TCT Live Show. Edward Attenborough gives a presentation on Digital Dentistry in Lecture Theatre 4 at the Ricoh Arena in Coventry. Come and see us at the UK's biggest event for dental technicians at the Ricoh Arena in Coventry, where we will be launching pour new partnerships with Roland, Datron and Bego, whilst unveiling the new release of the Dental Wings Operating system on the 3Series scanners with all the latest CAD functionality. We are on stands E25, E26 and E27 and look forward to seeing you there. For more information visit DTS 2012. We exhibit the Dental Wings 3Series scanner and Roland DWX-50 5-axis milling machine at the National Dental Technicians Conference in Loughborough, launching our new partnership and UK dealership with Roland. Just about anyone who is anyone in the dentistry business gathered at the NEC Birmingham for The Dentistry Show on Friday 2nd and Saturday 3rd March. Edward Attenborough speaks at the last in the 2011 series of the BDTA - BACD The Future of Dentistry - Should you be Scared? road show events in Bristol. Edward Attenborough and Michel Divet of Dental Wings present the new version 3 of the Dental Wings Operating System in Harrogate. Meet Edward Attenborough at the BSDHT Oral Health Conference in Bournemouth. Come and see us at the UK's premier dental exhibition, Dental Showcase, which will take place at NEC Birmingham on October 20 - 22, 2011. Over 10,000 members of the dental team are expected to attend the three-day event. More than 300 companies from the UK and abroad are likely to exhibit and the exhibition will cover a massive 17,000 sqm. For more information visit Dental Showcase 2011. October 21, 2011 - Dental Lab @ Showcase - Live! 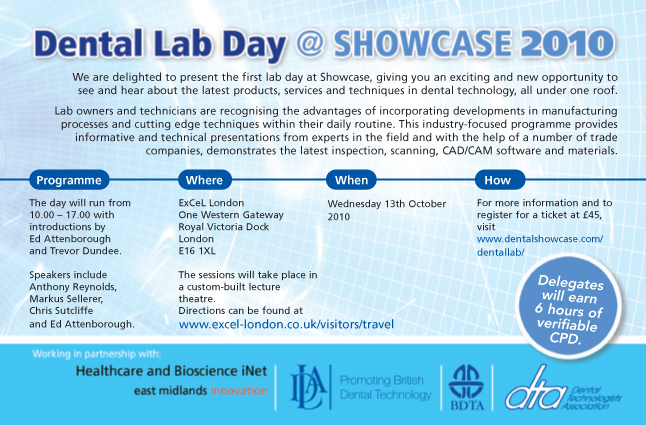 On the 21st October 2011, the British Dental Trade Association, Dental Laboratories Association and Dental Technicians Association will be presenting the second lab day at the BDTA Showcase, giving dental laboratory owners and dental technicians an exciting and new opportunity to see and hear about the latest products, services and techniques in dental technology all under one roof. In recent years lab owners and dental technicians have recognized the advantages to be gained from incorporating advances in the manufacturing processes and cutting edge techniques within their daily routine. This industry-focused programme will provide informative and technical presentations from experts in the field. There will also be a number of trade companies highlighting the latest inspection, scanning, CAD/CAM software and materials. Speakers for the day include Michel Divet, the European Business Development Manager for Dental Wings, who will be enlightening delegates on the true meaning of 'open platform' as well as giving tips on how to avoid obsolescence! Edward Attenborough presents on Digital Dentistry at the Time Compression Technologies in Lecture Theatre 4 at the Ricoh Arena in Coventry. Meet Edward Attenborough at the Practice Plan Forum at the Nottingham Belfry. Edward Attenborough speaks at the fifth of 6 BDTA - BACD The Future of Dentistry - Should you be Scared? road show events in Bristol. Edward Attenborough speaks at the fourth of 6 BDTA - BACD The Future of Dentistry - Should you be Scared? road show events in Bristol. Come and see us at the BDA annual conference in Manchester, one of the major events in the dental calendar attracting over 3,000 visitors across the three days - Thursday, Friday and Saturday. Edward Attenborough speaks at the third of 6 BDTA - BACD The Future of Dentistry - Should you be Scared? road show events in Bristol. Meet Edward Attenborough at ADDE AGM in Windsor hosted by the BDTA. Edward Attenborough presents on career opportunities in dental technology at the BDA London. Come and see us in Hall 10.2, Aisle U, Stand 020 at the Worlds biggest dental show. For more information visit IDS 2011. 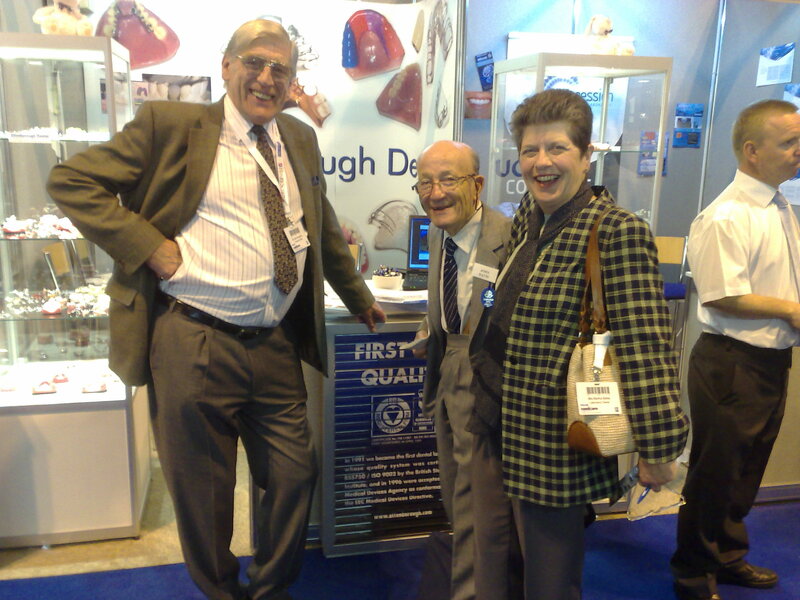 Meet Edward Attenborough at the Dental Technicians Conference at the East Midlands Conference Centre in Nottingham. Edward Attenborough speaks at the second of 6 BDTA - BACD The Future of Dentistry - Should you be Scared? road show events in Bristol. Meet Edward Attenborough at BES Spring Scientific Meeting in London. Come and see us on stand F24 at the Dentistry Show at the NEC in Birmingham where we will be exhibiting our revolutionary CAD-CAM based dental laboratory services. We exhibit our rotary polishing products for the fifth time at the LMT Lab Day at the Chicago Sheraton Hotel & Towers, the largest dental technology show in the USA. Edward Attenborough makes the opening speech at the BADN Conference in Blackpool. Come and see us at the UK's premier dental exhibition, Dental Showcase, which will take place at ExCeL, London Docklands on October 14 - 16, 2010. Over 10,000 members of the dental team are expected to attend the three-day event. More than 300 companies from the UK and abroad are likely to exhibit and the exhibition will cover a massive 17,000 sqm. For more information visit Dental Showcase 2010. On the 13th October 2010, the British Dental Trade Association, Dental Laboratories Association and Dental Technicians Association will be presenting the first lab day at the BDTA Showcase, giving dental laboratory owners and dental technicians an exciting and new opportunity to see and hear about the latest products, services and techniques in dental technology all under one roof. For more information visit Dental Lab @ Showcase, we look forward to seeing you there. We have great pleasure in inviting you and your team to our complimentary Study Club evening to discover exciting new developments in 21st Century Digital Dentistry. Held in conjunction with Practice Plan the venue is the Hilton Airport Hotel, Dublin on Wednesday 1sy September 2010, with a buffet included at 6:30pm. In addition to receiving 2 hours verifiable CPD attendance will also give automatic entry to our exclusive Premier CAD-CAM crown and bridgework offer. For more information visit Dentistry in the 21st Century, we look forward to seeing you there. Held in conjunction with Henry Schein the venue is the Schein Showroom, Marble Arch, London on July 22 2010, with a buffet included at 6:30pm. In addition to receiving 2 hours verifiable CPD attendance will also give automatic entry to our exclusive Premier CAD-CAM crown and bridgework offer. We look forward to seeing you there. Come and see us at the BDA annual conference in Liverpool, one of the major events in the dental calendar attracting over 3,000 visitors across the three days - Thursday, Friday and Saturday. The 2010 conference comprises of a series of scientific sessions and workshops, featuring over 90 speakers from across the UK, Europe and the USA. Come and see us on the first UK Pavillion organised by the BDTA Export Group at the IDEM in Singapore, where we will be exhibiting our rotary polishing brushes for the first time. Come and see us at the UK's biggest event for dental technicians at the Ricoh Arena in Coventry, where we will be unveiling some revolutionary new lab technologies. We are on stands E25 and E26 and look forward to seeing you there. For more information visit DTS 2010. Come and see us at the Dentistry Show at the NEC in Birmingham where we will be exhibiting our revolutionary CAD-CAM based dental laboratory services. Come and see us on the first UK Pavillion organised by the BDTA Export Group at the AEEDC UAE International Dental Conference and Exhibition in Dubai, where we will be exhibiting our rotary polishing brushes for the first time. Come and see us at the Dental Forum in Paris. Held in conjunction with The Centre for Cosmetic Dentistry the venue is Leicester on Thursday 28th January 2010, with a buffet included at 6:30pm. Come and see us at the ADF in Paris. Held in conjunction with Practice Plan and the Dental Directory the venue is Maidstone on Tuesday 24th November 2009, with a buffet included at 6:30pm. In addition to receiving 2 hours verifiable CPD attendance will also give automatic entry to our exclusive Premier CAD-CAM crown and bridgework offer. For more information visit Digital Dentistry, we look forward to seeing you there. Held in conjunction with Practice Plan and the Dental Directory the venue is Oxford on Tuesday 17th November 2009, with a buffet included at 6:30pm. Come and see us at the UK's premier dental exhibition, Dental Showcase, which will take place at NEC, Birmingham on November 12 - 14, 2009. Over 12,000 members of the dental team are expected to attend the three-day event. More than 300 companies from the UK and abroad are likely to exhibit and the exhibition will cover a massive 17,000 sqm. For more information visit Dental Showcase 2009. Edward Attenborough gives a presentation on rapid manufacturing, CAD-CAM and Digital Dentistry at the Sheffield Dental School, Claremont Crescent, Sheffield. For more information see www.dentaladditions.co.uk. Come and see us at the second Dental SIG meeting we have helped organise at the Ricoh Arena Coventry in conjunction with Time Compression Technologies (TCT), the Health Technologies Knowlege Transfer Network (KTN) and the Healthcare and Bioscience iNet. Entitled "Digital Manufacturing and Materials for Dentistry" for more information visit Dental SIG. Held in conjunction with Practice Plan and the Dental Directory the venue is the North East Private Dentists Group in Newcastle on Thursday 24th September 2009, with a buffet included at 6:30pm. Come and see us at the first Dental SIG meeting we have helped organise at BioCity in conjunction with the Health Technologies Knowlege Transfer Network (KTN) and the Healthcare and Bioscience iNet. Entitled "Digital Dentistry and Facial Aesthetics - The Virtual Dental Patient" for more information visit Dental SIG. Edward Attenborough attends the GDC Education Committee meeting at Wimpole Street. Come and see us in Hall 10.2, Aisle U, Stand 020 at the Worlds biggest dental show. For more information visit IDS 2009. We exhibit our rotary polishing products for the fourth time at the LMT Lab Day at the Chicago Sheraton Hotel & Towers, the largest dental technology show in the USA. Held in conjunction with Practice Plan and the Dental Directory the venue is the Royal Berkshire Conference Centre, Madjeski Stadium on Tuesday 2nd December 2008, with a buffet included at 6:30pm. Held in conjunction with Practice Plan and the Dental Directory the venue is the Forest of Arden Hotel & Country Club, Meriden on Thursday 6th November 2008, with a buffet included at 6:30pm. Held in conjunction with Practice Plan and the Dental Directory the venue is the Hollins Hall Hotel & Country Club on Tuesday 14th October 2008, with a buffet included at 6:30pm. Come and see us at the UK's premier dental exhibition, Dental Showcase, which will take place at ExCeL, London Docklands on October 2 - 4, 2008. Over 10,000 members of the dental team are expected to attend the three-day event. More than 300 companies from the UK and abroad are likely to exhibit and the exhibition will cover a massive 17,000 sqm. For more information visit Dental Showcase 2008. Held in conjunction with Practice Plan and the Dental Directory the venue is the Marriott Hotel, Northampton on Thursday 9th September 2008, with a buffet included at 6:30pm. We have great pleasure in inviting you and your team to our complimentary Study Club evening to discover exciting new developments with the Astra Cresco CAM system for the fabrication of large span / full beam implant borne screw-retained bridge frameworks. Held in conjunction with Astra the venue is the Dakota Hotel, Nottingham on Wednesday 21st May 2008, with a buffet included at 6:30pm. In addition to receiving 2 hours verifiable CPD attendance will also give automatic entry to our exclusive Cresco frameworks offer. For more information visit Cresco, we look forward to seeing you there. We are on stands G25 and F26 and look forward to seeing you there. For more information visit DTS 2008. The 2008 conference comprises of a series of scientific sessions and workshops, featuring over 90 speakers from across the UK, Europe and the USA. Held in conjunction with Practice Plan and the Dental Directory the venue is the Marriott Hotel, Gosforth Park, Newcastle on Tuesday 22nd April 2008, with a buffet included at 6:30pm. Meet Edward Attenborough at the Dental Forum in Paris, the principle annual dental technology show in France, where we will be launching our own label range of laboratory products with our exclusive new distributor. Please contact one of our team for details. Held in conjunction with Practice Plan and the Dental Directory the venue is the De Vere Whites Hotel, Bolton on Tuesday 4th March 2008, with a buffet included at 6:30pm. Come and see us at the LMT Lab Day at the Chicago Sheraton Hotel & Towers, the largest dental technology show in the USA, where we will be exhibiting our rotary polishing products. Held in conjunction with Practice Plan and the Dental Directory the venue is the Ramada Hotel in Cannock on Tuesday 5th February 2008, with a buffet included at 6:30pm. Come and see us at the BDTA Midwinter Meeting at the Royal Society of Medicine in London. Please contact one of our team for details. Come and see us at the BDA Awards Dinner in London. Please contact one of our team for details. Come and see us at the ADF in Paris, the principle annual dental show in France. Please contact one of our team for details. Come and see us at the BACD's 4th Annual Conference, for more information visit BACD Conference 2007. Meet us during our 2-week tour of South Africa at Johannesburg, Pretoria or Cape Town. Please contact one of our team for details. Come and see us at the UK's premier dental exhibition, Dental Showcase, which will take place at NEC, Birmingham on October 18 - 19, 2007. For more information visit Dental Showcase 2007. Come and see us at the World Aesthetic Congress at the QE II Conference Centre in London. For more information visit World Aesthetic Congress 2007. Come and see us at the BDA annual conference in Harrogate, one of the major events in the dental calendar attracting over 3,000 visitors across the three days - Thursday, Friday and Saturday. The 2007 conference comprises of a series of scientific sessions and workshops, featuring over 90 speakers across three days from across the UK, Europe and the USA. Edward Attenborough will be speaking on Medical Device Matters: the dental practice's role in the revised legislation, hosted by the DLA in room L3 at 12:45pm on Saturday 26th May. For more information visit BDA Conference 2007. Come and see us at the Aesthetic Dentist Show at the NEC in Birmingham. For more information visit The Aesthetic Dentist 2007. 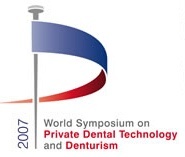 The World Symposium on Private Dental Technology and Denturism is coming to the UK for the very first time! This truly global event - organised by the Dental Laboratories Association, Clinical Dental Technicians Association and International Federation of Denturists - takes place on Friday 11th and Saturday 12th May 2007 at the Ricoh Arena in Coventry. In previous years the Symposium has solely focused on denturism, but 2007 marks another first, as it broadens its scope to encompass other expert disciplines within dental technology. Come and see us on stand C11. For more information visit Denturism 2007. 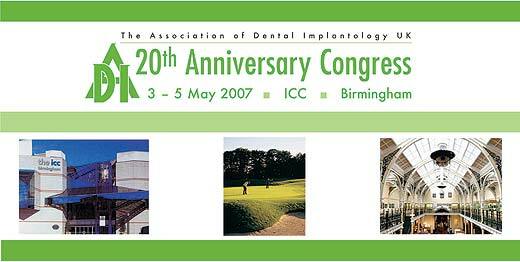 For more information visit ADI Congress 2007. We have great pleasure in inviting you and your team to our complimentary Study Club evening to discover exciting new developments in computer aided implantology, including CT radio-opaque stent fabrication, the Simplant software suite and Surgiguide manufacture. Held in conjunction with Image Diagnostic Technology the venue is the UCL Eastman Dental Institute, London on Wednesday 11th April 2007, with a buffet included at 6:30pm. For more information visit IDT Lecture (PowerPoint 27.1 MB), we look forward to seeing you there. Held in conjunction with Practice Plan and the Dental Directory the venue is the Park Inn, Nottingham on Wednesday 11th April 2007, with a buffet included at 6:30pm. Come and see us in Hall 10.2 (old 14.2), Aisle U, Stand 020 at the Worlds biggest dental show. For more information visit IDS 2007. Come and see us on table 208 on Saturday at the USA's biggest dental lab show. For more information visit LAB DAY� 2007. 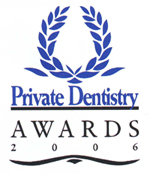 We are delighted to have been short listed as finalist in the Private Dentistry Lab of the Year Award - click here for further information. Come and see us at the BACD's 3rd Annual Conference, entitled "The Aesthetic Team: A Multidisciplinary Approach to Success". For more information visit BACD Conference 2006. Come and see us at Denplan's opinion leaders 20th birthday conference, where we will be piloting our exclusive CAD-CAM all-ceramic crown and bridgework scheme for Denplan clinicians. For more information visit Denplan National Conference 2006. Come and see us on stand H13 at the London Dental showcase, Excel Docklands. For more information visit Dental Showcase 2006. Come and see us at Denplan's 20th birthday celebration.